I know, lots of iPhone’s news came out. 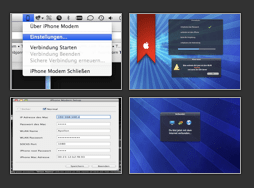 Today I wont write about this repetitive news (New iPhone firmware, new PWNG tool, new cracked applications and so forth…) I wanna point out a very interesting work called iPhoneModem. During these days, some people mailed me asking why iPhone cannot be use as a modem. I dunno. I’ve never tried to use the iPhone as a modem, fortunately I got wifi access in my office and in my home, so I don’t need GPRS/Edge connection during the way from home to office and vice versa. Anyway, I’ve looked around and the only stuff I founded was “iPhone Tethering Kit” which is a good framework but it takes too much time to be operative. So after some other google research I’ve founded iPhone Modem that, it’s not new works great. AppStore doesn’t want it. Again, I dunno why, but this project is still alive and works fine. It is certainly interesting for me to read the post. Thanks for it. I like such themes and everything connected to this matter. I would like to read more on that blog soon.